ONE type of machine, the "Whippet," is being shown - one complete machine, and one "dissected" - by the Austin ДальшеMore>>> Co. 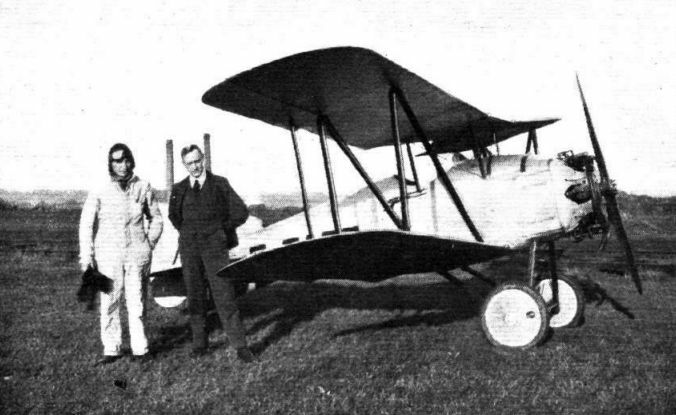 The "Whippet" is a single-seater tractor biplane for civil use, suitable for business, sport and pleasure. It is essentially a one-man 'plane, being designed specially for the "owner-pilot," maintenance and flying being brought to the greatest degree of ease and simplicity. This is achieved in the "Whippet" by constructing the fuselage entirely of steel, and fitting streamlined steel struts in place of bracing wires, thus doing away with the necessity of constant rerigging. It also has folding wings - which are very securely locked in position when flying - enabling the machine to be housed in a shed 18 ft. long, 9 ft. wide and 8 ft. high. It is an easy machine to fly - it can be flown with "hands off" - and the landing speed as low as 35 m.p.h. The steel construction is also advantageous in tropical climates, apart from the question of strength and ability to withstand rough usage. The engine is a 45-50 h.p. 6-cyl. radial Anzani, with which a maximum speed, at ground level, of 95 m.p.h. is obtained. The speed at 10,000 ft. is 80 m.p.h., and the climb to 5,000 ft. and 10,000 ft. is 9 mins. and 22 mins., respectively. The wings, which have a high factor of safety, are of standard construction, whilst the tail plane can be adjusted to suit different weights of pilots. An orthodox V-type landing chassis is fitted, and the tail skid is steerable, consisting of a compression spring working inside telescopic tubes; in order to give a good wearing surface, a special shoe is fitted, consisting of vertical laminated plates. A comfortable seat is fitted, and the cowling and wind-screen are arranged so as to give complete protection to the pilot. A cupboard is provided under the seat for luggage and tools. On the Austin stand one sees examples of the one-man sporting type machine, in the design of which simplicity and ease of upkeep have been first considerations. 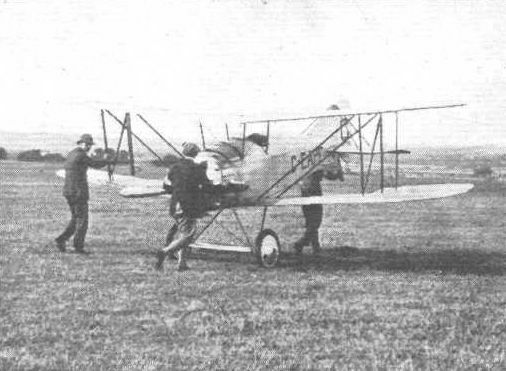 It is quite certain that the "owner pilot" will not wish to be bothered with constantly having to make adjustments to his machine, such as stripping the covering off his fuselage to tighten up wires after a rough landing, or to be constantly going over his wings with plumb line, spirit level and incidence gauge. In the Austin "Whippet" a serious attempt has been made to obviate the necessity of these adjustments by so designing the machine that once erected and trued up, it is not likely to require much in the way of adjustment afterward, certainly not until after considerable use. The manner in which this is brought about is, as regards the fuselage, to do away with all diagonal wire bracing. The four longerons are thin steel tubes, as are also the vertical and horizontal struts. The structure is kept in proper alignment by diagonal steel tubes attached to clips on the longerons, and made to exact length in the first place, so that once bolted up no further adjustment is necessary. A similar method has been employed in the wing bracing. Instead of the ordinary lift and landing wires, two long tubes slope outward from the lower wing root to the top of the interplane struts. When the machine is in the air, these tubes are, of course, in tension, while when the machine is upside down or resting on the ground they are in compression. It is not anticipated that any adjustments will have to be made for long periods, but should this be necessary provision has been made, by a series of holes in the tubes and their sockets, to make easily and quickly any adjustment that might be required. Some of our sketches will help to explain the detail design. 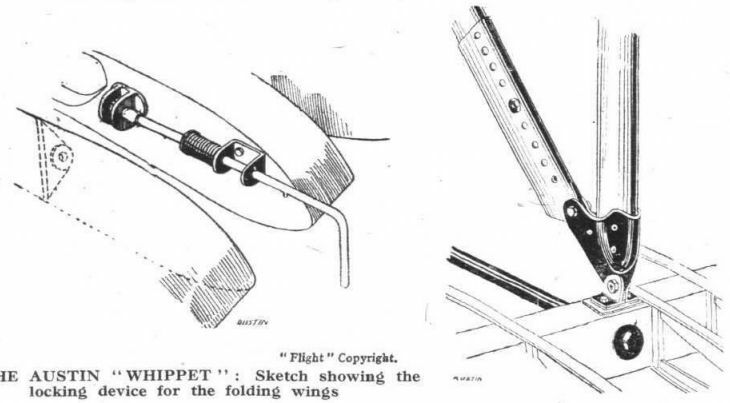 A point which attracts special attention in this little machine is the fact that in spite of its small size, it is fitted with folding wings, a fact which should go a long way towards popularizing the Austin "Whippet," seeing that, when folded, it occupies little more space than an ordinary motor-car. As the engine is of low horse-power - 45-50 Anzani - the fuel consumption is low, and the running costs should be relatively small. THE AUSTIN "WHIPPET": Fitted with a six-cylinder Anzani engine of 45 h.p. this machine has an excellent performance coupled with low landing speed. It is used by an Air Force Officer as a run-about, and has been in service for some four or five years. The little machine is the Austin "Whippet" with 45 h.p. Anzani, designed by John Kenworthy and produced in 1919. 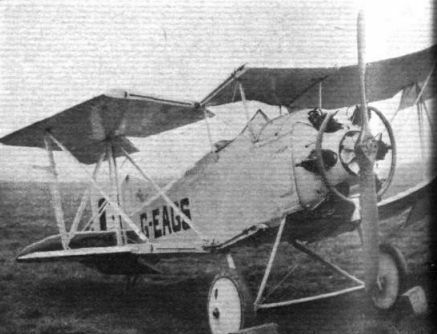 This machine was the first post-war light plane, but it was, unfortunately, before its time, there was then no demand for such a machine, and it never went into quantity production. We believe the machine is still in existence, or was until quite recently. The first post-war light aeroplane, the Austin Whippet (50 h.p., 6-cyl. Anzani), designed by Mr. John Kenworthy, who later produced the Redwing. The Austin "Whippet" going out for the Private Owners' Handicap.